Enter the chance of winning a fab prize! All you need to do is like our Facebook page and share it, comment and share our articles, tell us which is your preferred recipes, submit your latest culinary creations… interact with us as you please! Our top fan will win a HANNspree digital photo alarm clock frame thanks to AtoZ Electonics. You can check your ranking position on our Facebook page Top Fan tab. Competition closing date is Sunday 5 August 2012 at hr 16.00 (local time). The winner will be announced on Monday 6 August 2012 at 12.00 pm (local time) through our Facebook page. Prize is non-transferable, non-negotiable and no cash alternatives will be offered. Competition is open to Maltese residents only. Terms and conditions apply*. 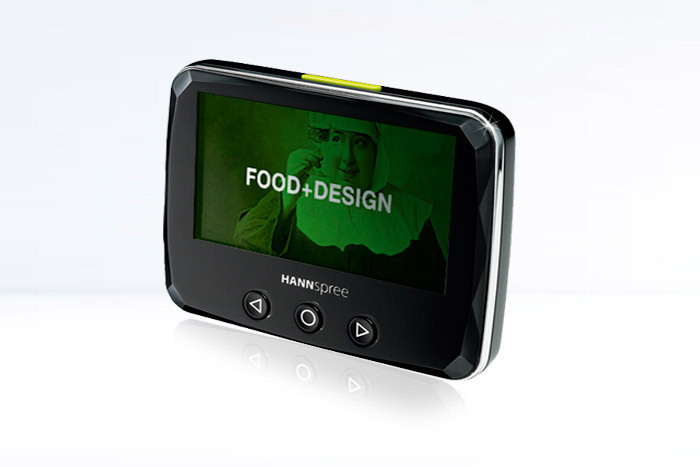 The Hannspree Xv-S Photo Alarm Clock SG4311SB features a 4.3″ LCD screen with a translucent decorative cover. The interplay of reflections on the multi-faceted bezel provides a visual sensation of depth akin to the sparkles in a diamond. With its all black mirror finish, the SG4311SB radiates style and self-confidence. Large and intuitive buttons, together with the traditional alarm clock switch design, makes for ease of use. Seven different styles of animated wallpaper are available and may be set to change for special themes. The SG4311SB may act as digital photo frame, music player and an FM receiver with 25 favourite-stations. In another thoughtful touch, when the alarm goes off during your cooking, you can hit the green snooze button to check your cooking timing. There is also a cooking (sleep) function that plays your favourite music and photo recipes for 10, 30, 60 or 90 minutes. In addition to the calendar, snooze function, and auto lighting, three default alarm tones are provided. The USB 2.0 port may be used to transfer photos and music effortlessly. Even if the SG411SB runs out of power, all of your settings will be retained for up to 3 days, saving time and effort. *Terms & Conditions: • To participate in this competition, participants must like MOKAPINK.com page. • After liking the page participants will be subscribed to the competition • Only submissions received through the Facebook application will be considered acceptable for this competition. • Participants must be 18 and over and should be Maltese or Gozitan Residents. • No purchase or payment is necessary to participate in MOKAPINK.com competition. • Competition closing date is Sunday 5 August 2012 at 16.00 hrs. (local time). Any submissions following this date will not be considered. • The winner will be officially announced on MOKAPINK.com Facebook wall on Monday 6 August 2012 at 12.00 pm (local time). • Prize is non-transferable, non-negotiable and no cash alternatives will be offered. • MOKAPINK.com reserve the right to remove any comment/s that they deem unfit for the Facebook Page. • Winner will be contacted by email from MOKAPINK.com and instructed on how to get the Competition’s prize, a HANNspree digital photo alarm clock frame.